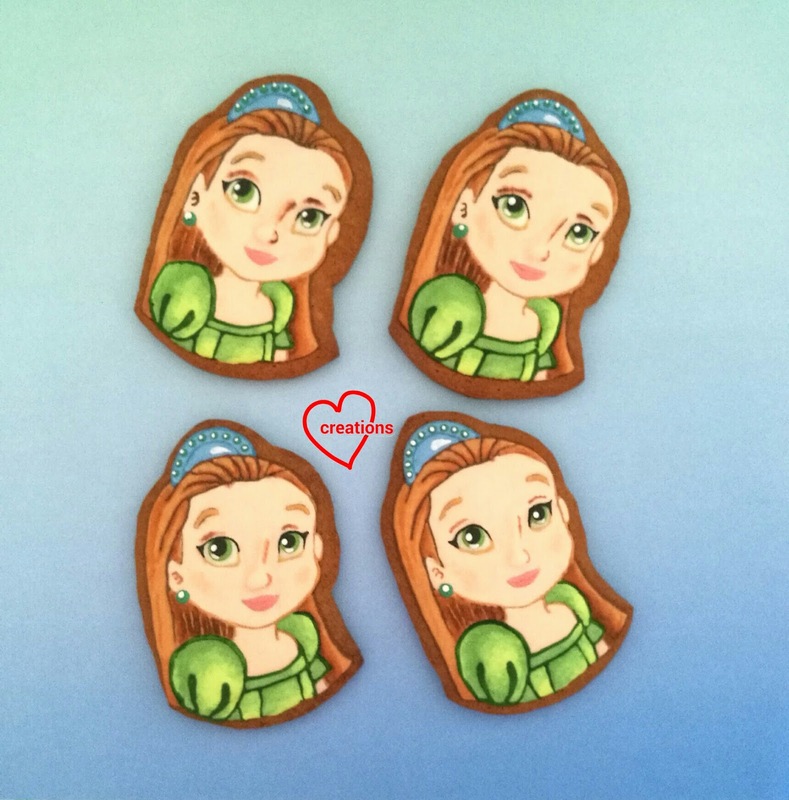 My friend requested for brown sugar cookies for her little girl who loves Princess Charity from The Princess Parables series. 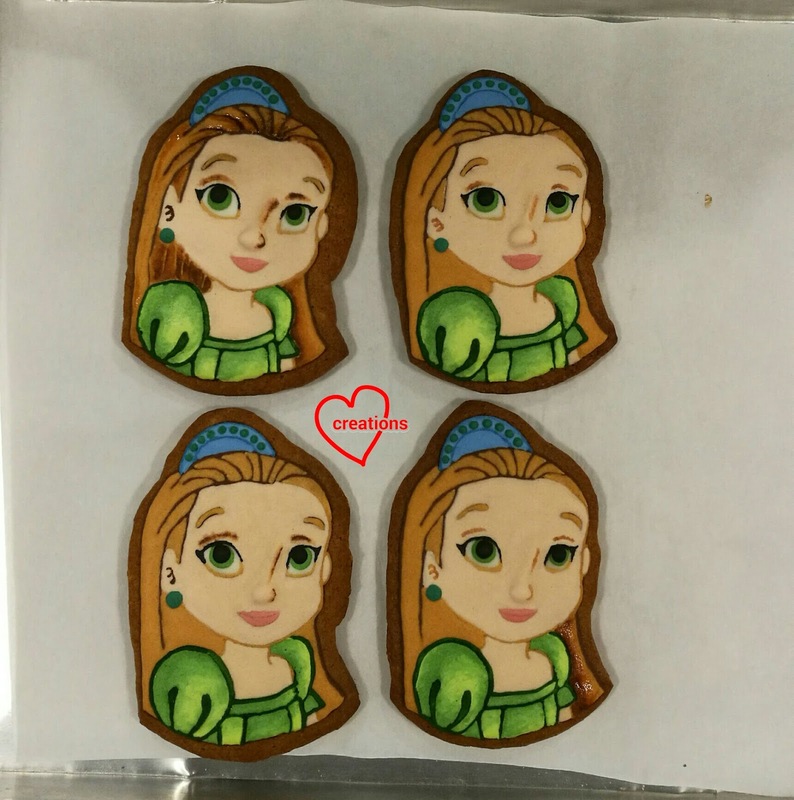 Here are the four cookies that I made for her! 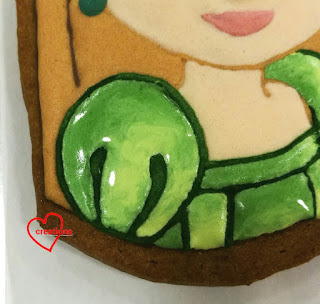 I have written a very detailed step by step recipe for the brown sugar cookie base and royal icing decoration in this post so I shall not repeat it here. 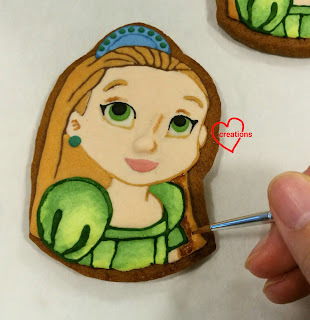 I will instead highlight how I created gradual tones or shades in two ways: using royal icing and using edible marker. 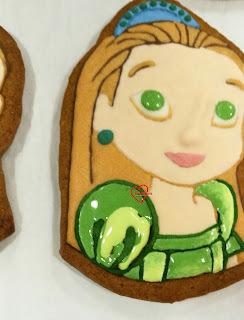 People often remark how life-like my iced cookies are. Besides paying attention to details like adding highlights to the eyes of the characters, using gradual shades of a colour (instead of a single solid colour) helps to liven up the character. Let me just reiterate that I have been using the same recipe for a few years because I always get rave reviews for these cookies in terms of taste. They have excellent shelf life of about 1.5 months at tropical room temperature when sealed so you can make these way ahead of time. 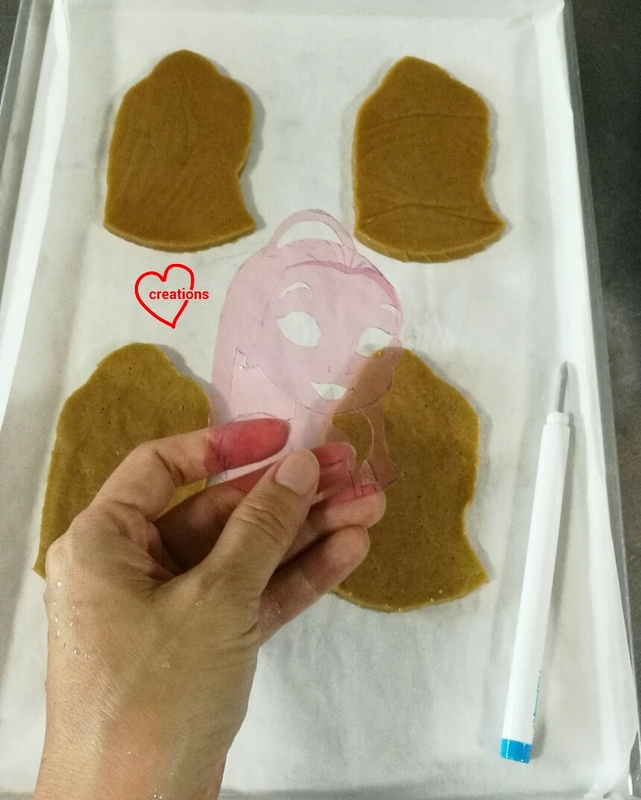 Cutting out cookie dough using homemade template. You may find out how to make and use your own templates over here. Tracing outline of Charity using edible marker. 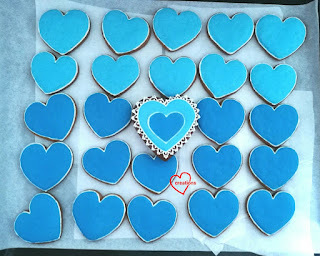 It is advisable at this point to let the cookies rest for a day between baking sheets to absorb excess oil from the cookie surface before icing. 1. Prepare the lightest and darkest shade of royal icing that you need. Consistency should be of flooding consistency whereby any peaks should disappear within 3 seconds. Add more icing sugar to stiffen the icing. Add more water to make the icing more runny. 2. Pipe the two shades one after another immediately. I am using the right sleeve as an example here. 3. Use a toothpick to make little swirls to merge the two shades. Add the required shade a drop at a time before swirling with toothpick again in areas where you need a little more of a particular shade. Work quickly before the icing starts to harden. 1. Ice the subject with the lightest shade of the colour that you need. Make sure the icing is completely dry before using edible marker on it. Preferably do this one day after letting the icing harden. 2. Draw or colour the area where you want the darkest shade to be using an edible marker. 3. 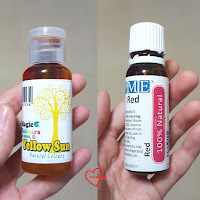 Use a small, soft brush dipped in vodka or any other colourless, odourless alcohol to spread the ink. 4. Wash the brush in alcohol and repeat spreading of the ink away from the coloured portion. I hope these tips have been helpful! I know not everyone has the patience to work on brown sugar cookies like I do but you may be curious about the techniques I use ;). 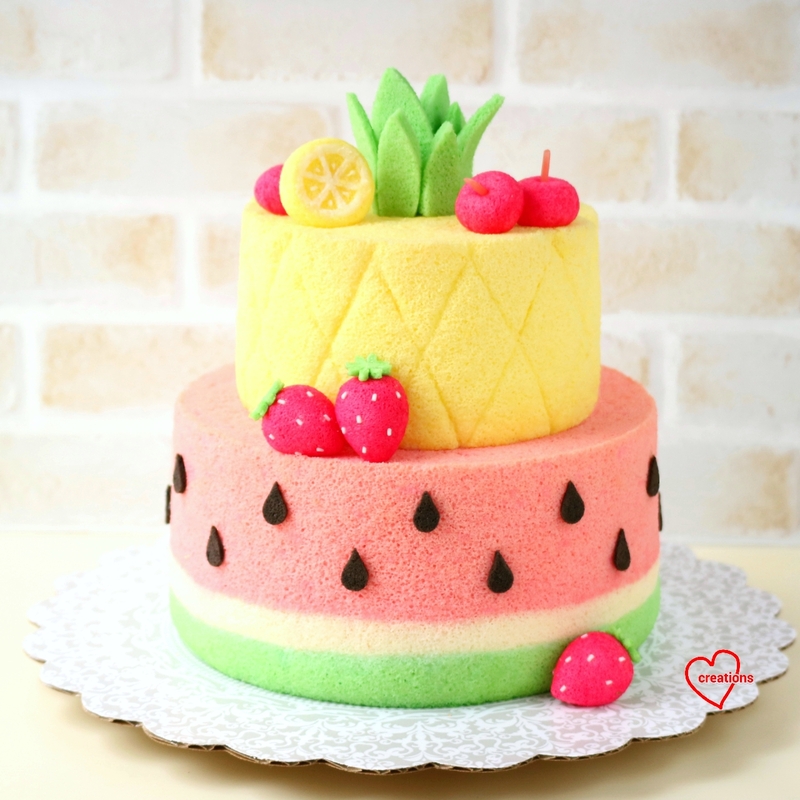 This yummy fruity tier cake is made entirely from Fruit-flavoured Chiffon cake! The "Pineapple" top tier is made from Lemon Chiffon Cake. 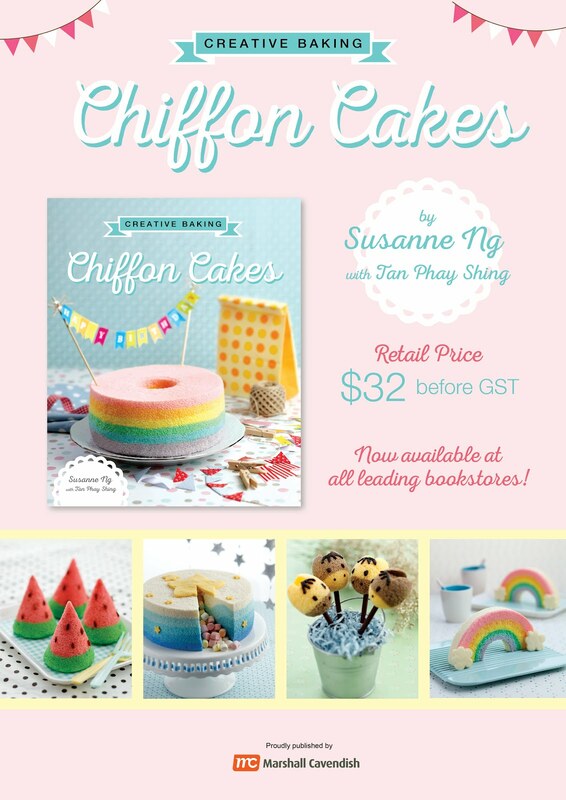 The "Watermelon" bottom tier is made from Strawberry Yoghurt-Pandan Chiffon Cake. I had originally wanted to use strawberry chiffon, but the Korean strawberry season is over, so I couldn’t find those nice sweet juicy strawberries (only the sour types), so yoghurt was used instead. 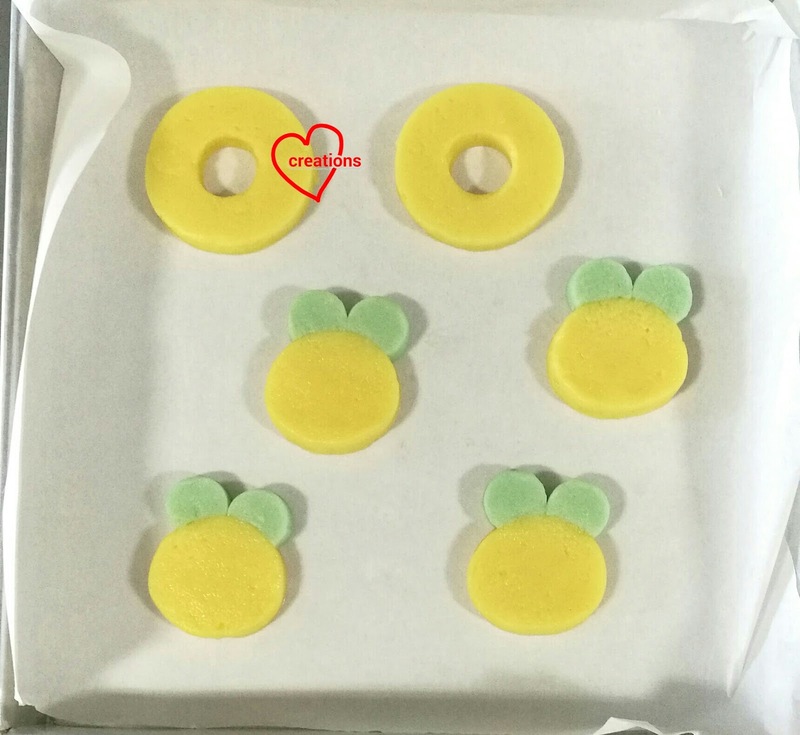 The small juicy fruits décor are also from chiffon cake: "lemon" from lemon chiffon, "cherries" and "strawberries" from strawberry yoghurt chiffon. 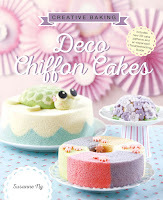 The cake is naturally coloured using natural coloring (Magic colours brand and PME, from baking supplies shops e.g. Bake king) and lemon zest. 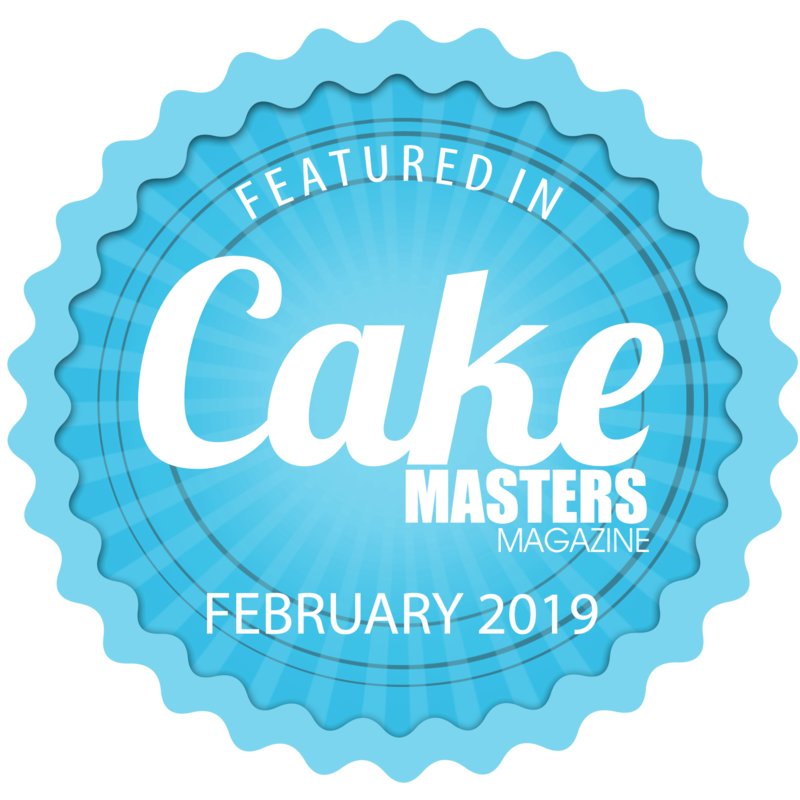 Lemon Chiffon Cake (6-inch tube pan) – which makes the "Pineapple"
2. Beat egg yolks with sugar with whisk till pale and light before stirring in oil, lemon juice and water. 3. Add in sieved flour and lemon zest and whisk till no trace of flour found. 5. Gently quickly fold in the meringue into respective batter in 3 additions. 6. Pour the batter into the tube pan and gently tap to remove air bubbles. 7. 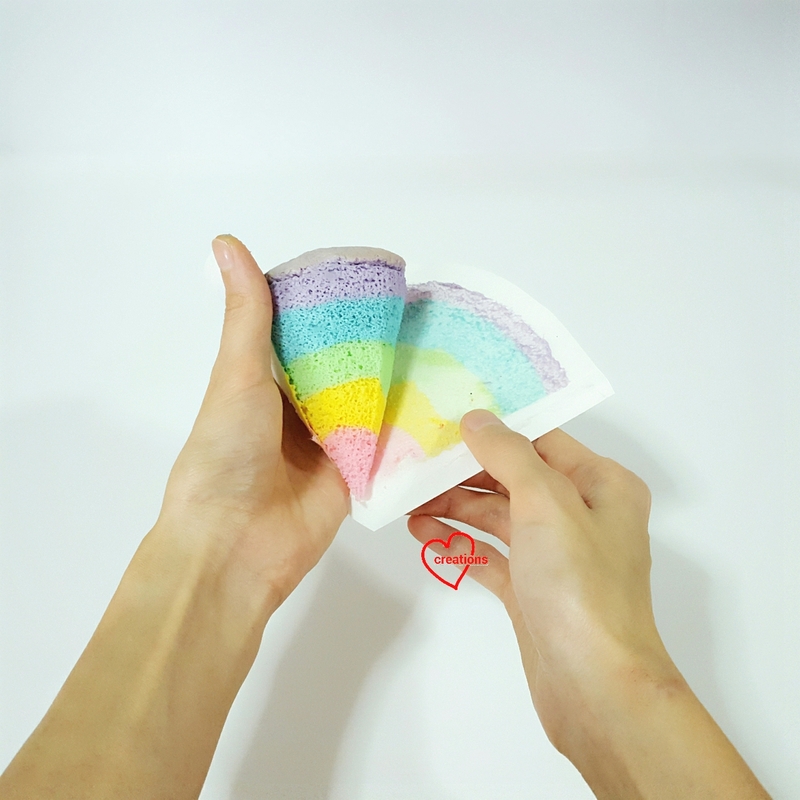 Bake the chiffon cake for 15 min at 160°C and then 140°C for 25-30 min, or until skewer inserted into centre of cake comes out clean. *You can also bake at 140°C for 55 min, or until skewer comes out clean. I used a knife to make cuts on the chiffon cake for pineapple-like patterns. 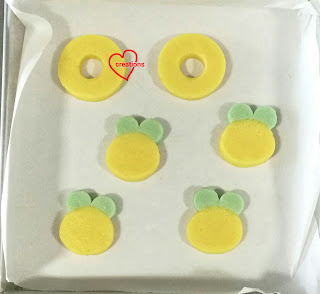 "Pineapple leaves": Cut from pandan chiffon sheet cakes. 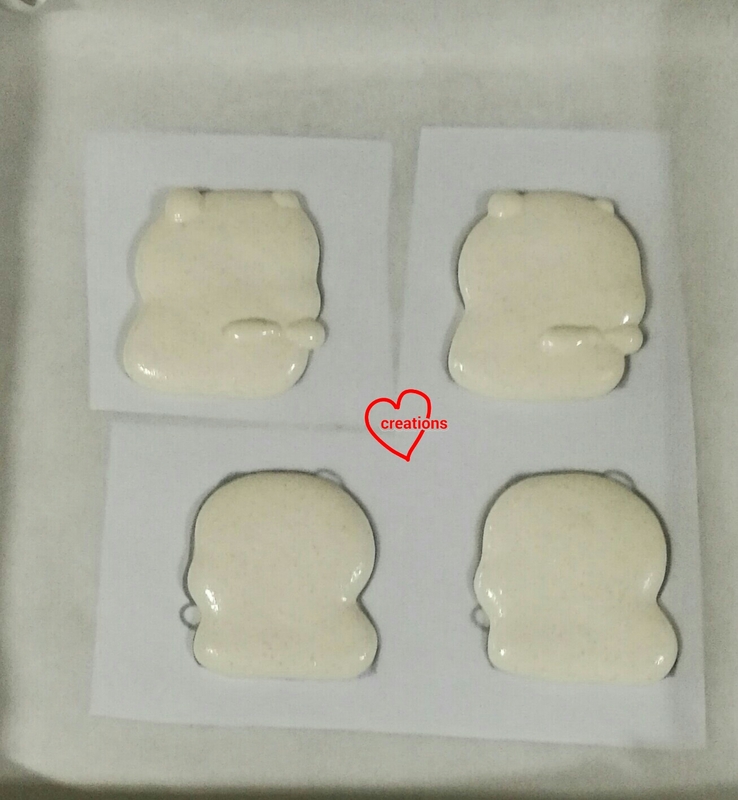 Glued with melted marshmallows. "Lemon": I baked leftover lemon chiffon batter in a 5-cm cake pop. 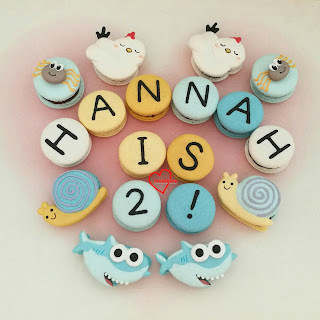 The white details were piped on using Candy melts. "Korean Strawberries": baked from hearts chocolate molds. 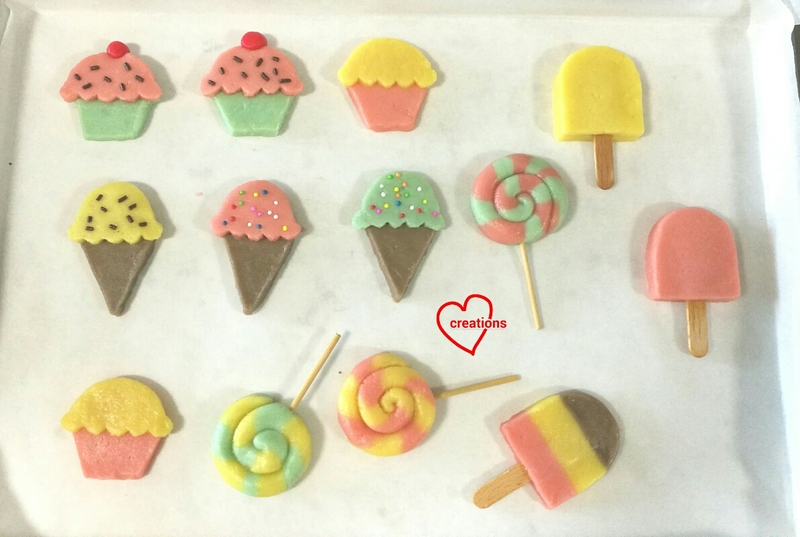 "Cherries": baked from 3-cm cake pop molds. 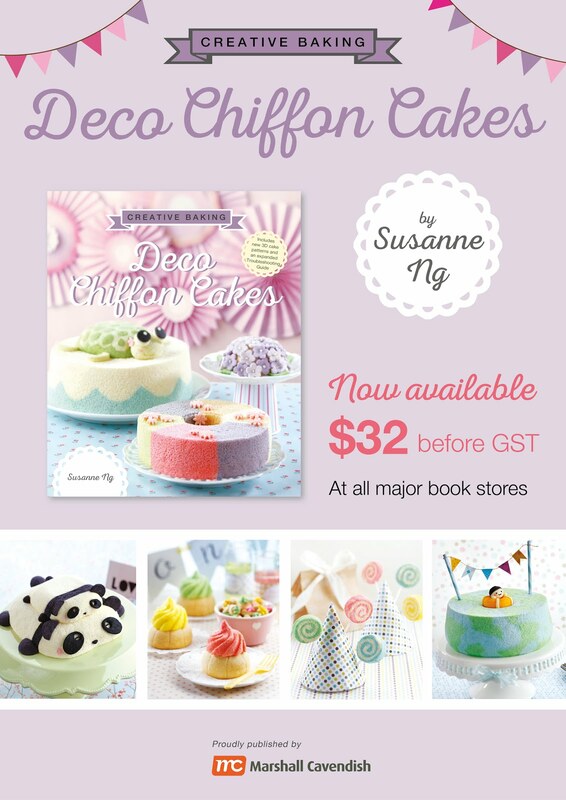 *Updates: Deco Chiffon Cakes now available at Naiise in Malaysia! 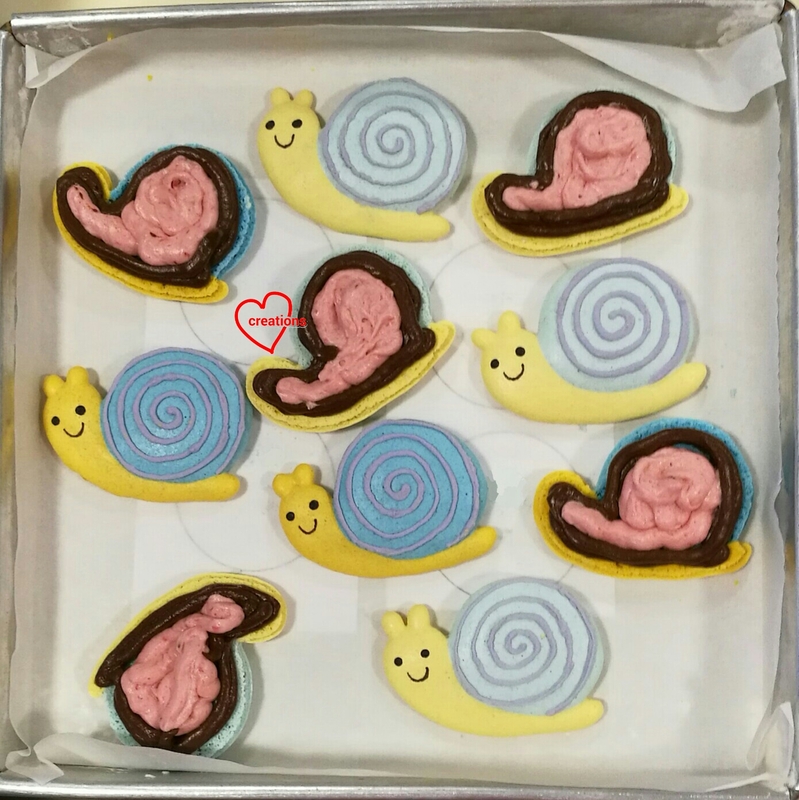 I love it when requesters give me relatively free rein for the design of bakes :). Someone requested for ice-cream and cupcake shortbread cookies that I made last year but I expanded the selection of desserts! 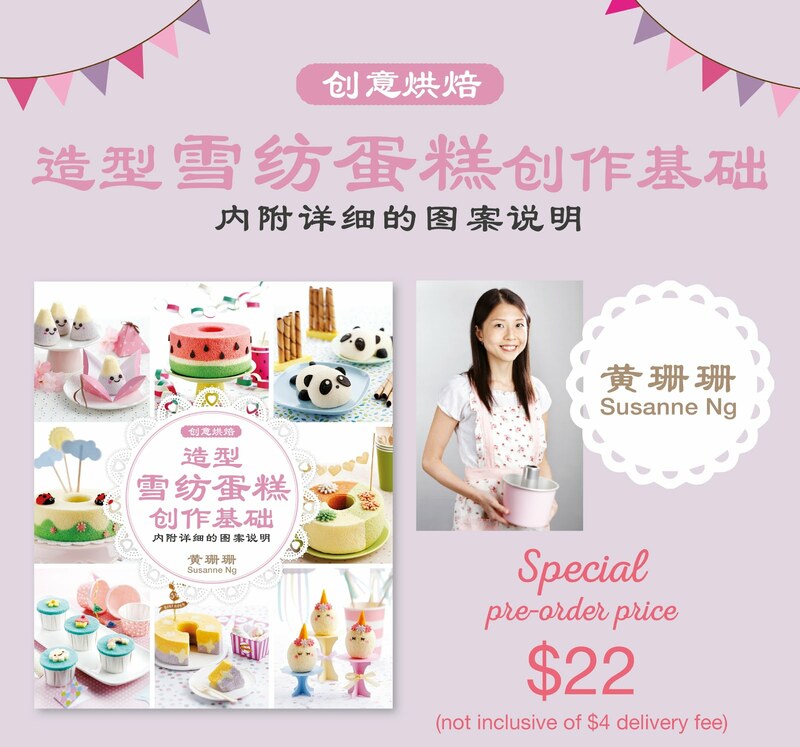 You may refer to this post for a detailed write-up of recipe and shaping steps for making the ice-cream cone and cupcake cookies using homemade templates. I will briefly describe what I did for this batch. 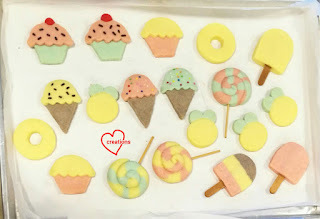 Please refer to this post on how to shape the lollipop cookie. I try to use as little artificial colouring as possible, relying on flavouring to colour the cookie dough instead. * You may replace with plain flour for a firmer, less melt in your mouth cookie. 1. Beat butter with icing sugar and salt until light and fluffy. 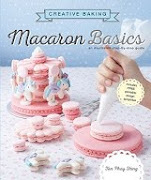 You may beat by hand or use an electric mixer. 2. Add sifted cornflour and plain flour. Fold in with a spatula until a ball of dough forms. 3. Divide dough into 72g for brown, blue and pink dough, 140g for yellow dough and 5g for red dough. You may divide the colours equally too if that's your preference. 4. Roll the dough between two baking sheets to desired thickness (4-6mm). 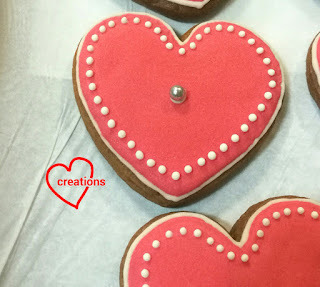 Use homemade cookie templates to cut out desired shapes or simply shape using your fingers. The lollipops for example, don't require templates. 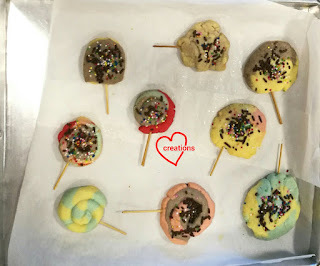 I made each lollipop using 7g of coloured dough for each colour. 5. Place cookie dough cutouts in baking tray lined with baking sheets. Chill in refrigerator until firm. Cookie dough cutouts! I made a few bee cookies as well for another request. 6. 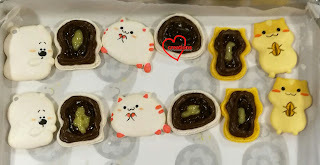 Bake in preheated oven at 150℃ for 15-17 min or until done. Use the middle rack. 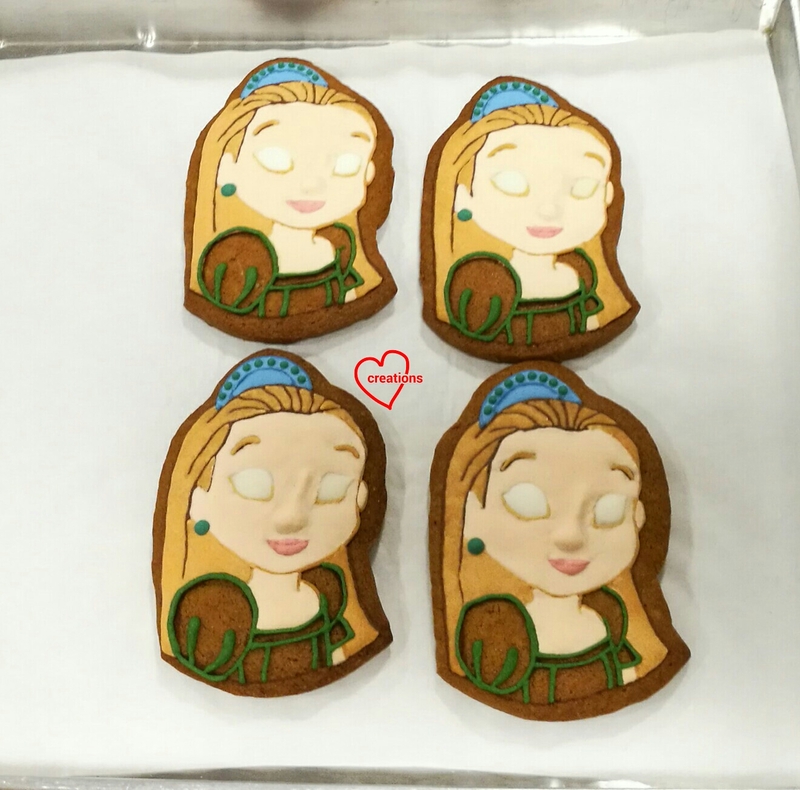 Keep an eye on the cookies to make sure they don't turn brown. 7. Let the cookies cool completely on the tray before decorating or storing in airtight container. 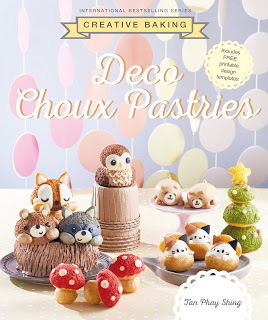 Decorate with royal icing or melted dark/milk chocolate and sprinkles as you wish. 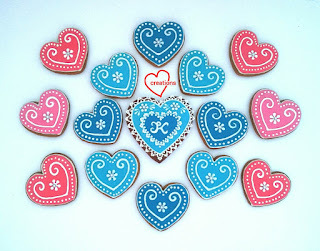 Store the decorated cookies in airtight container after the icing/chocolate has dried. These cookies can keep for about 1.5 months in airtight, cool room temperature. You can tell which one was done by me as a demo piece! My kids thought their creation was yummy ;). Social workers are a great support to many families in Singapore but their services often go unrecognized. I had the privilege to bake some door gifts for these people who have given their services with a big heart some months ago. 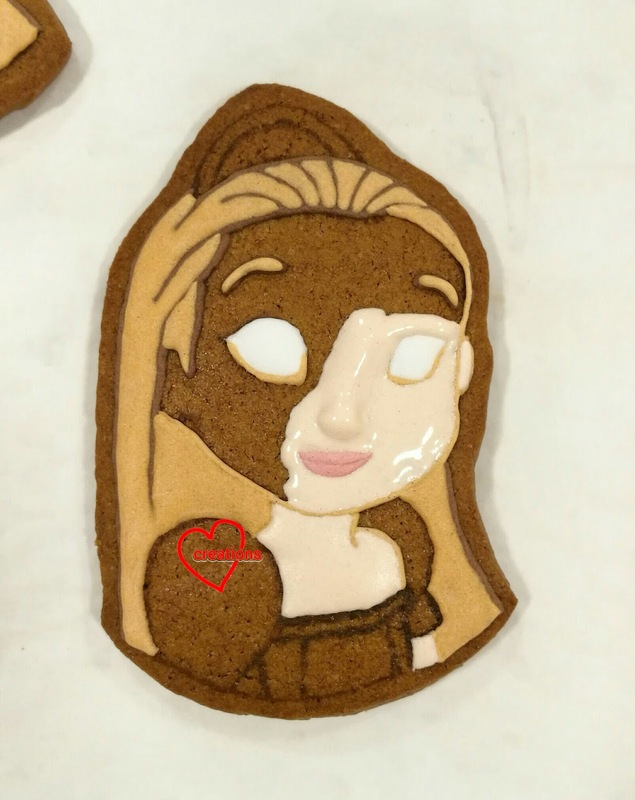 A special large cookie with a "K" was made for a staff who was leaving. 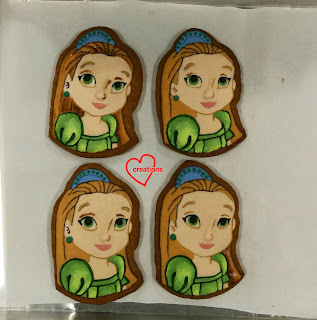 I have written a very detailed step by step recipe for the brown sugar cookie base and royal icing decoration in this post so I shall not repeat it here. Let me just reiterate that I have been using the same recipe for a few years because I always get rave reviews for these cookies in terms of taste. They have excellent shelf life of about 1.5 months at tropical room temperature when sealed so you can make these way ahead of time. 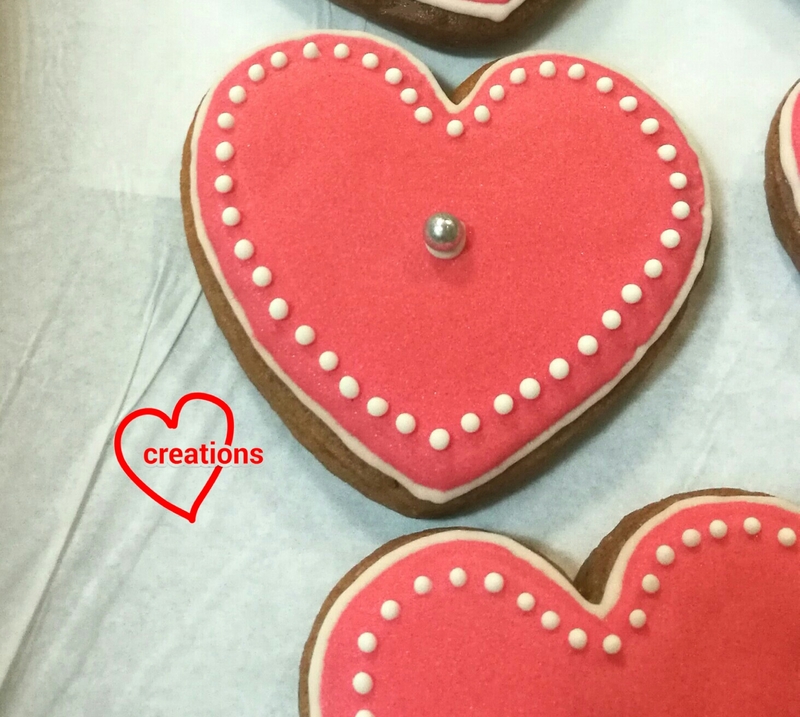 I was really busy with this large batch of 51 heart shaped cookies and another 20 PJ Mask cookies so I didn't take many photos. 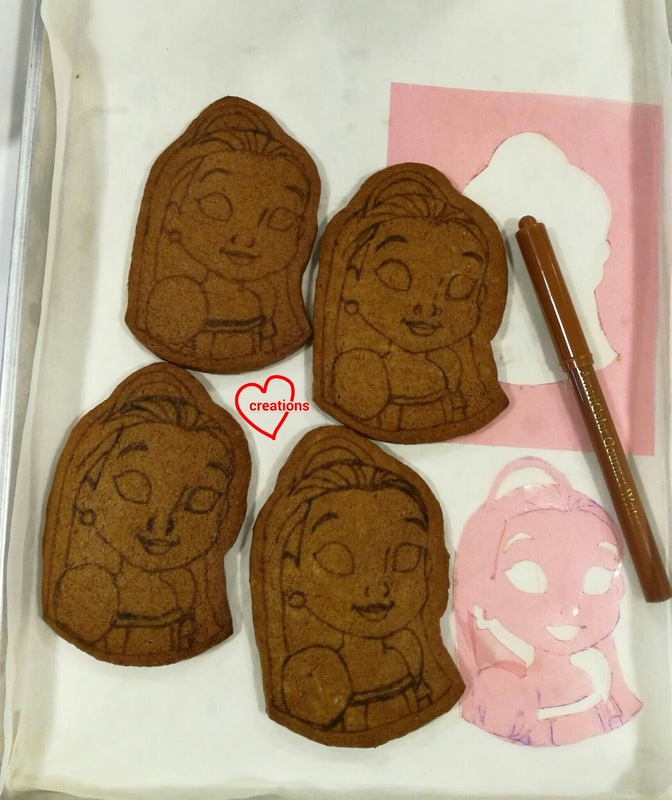 Here are a couple of works-in-progress photos of the cookies.. Here's my Forever Friends bear wishing Happy Father's Day to the wonderful daddies!! 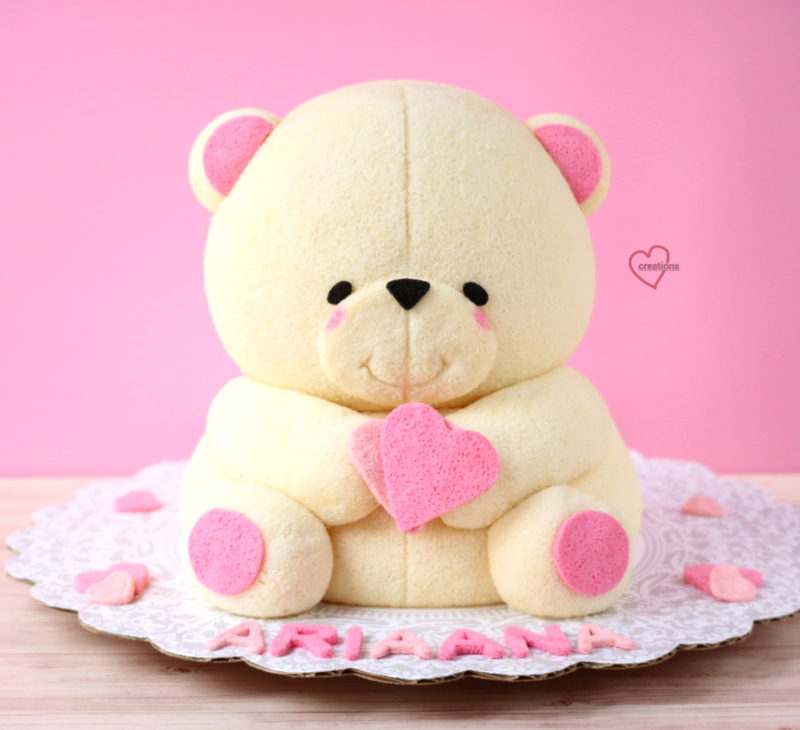 Yes it's chiffon cake and not stuffed toy =p This is actually my 3rd time making the cute bear! My most challenging version so far. 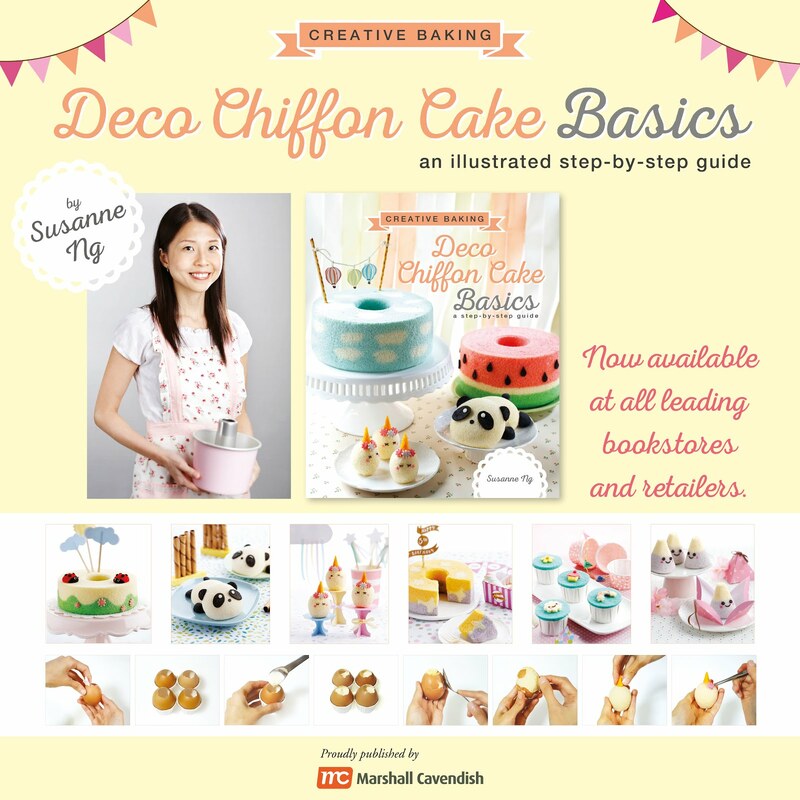 Recipe for the bear vanilla chocolate chiffon cake is here. I combined it with chiffon cake from a doll cake pan using the same recipe. Thankful it was well-received! Spider, chicken, shark and snail macarons! 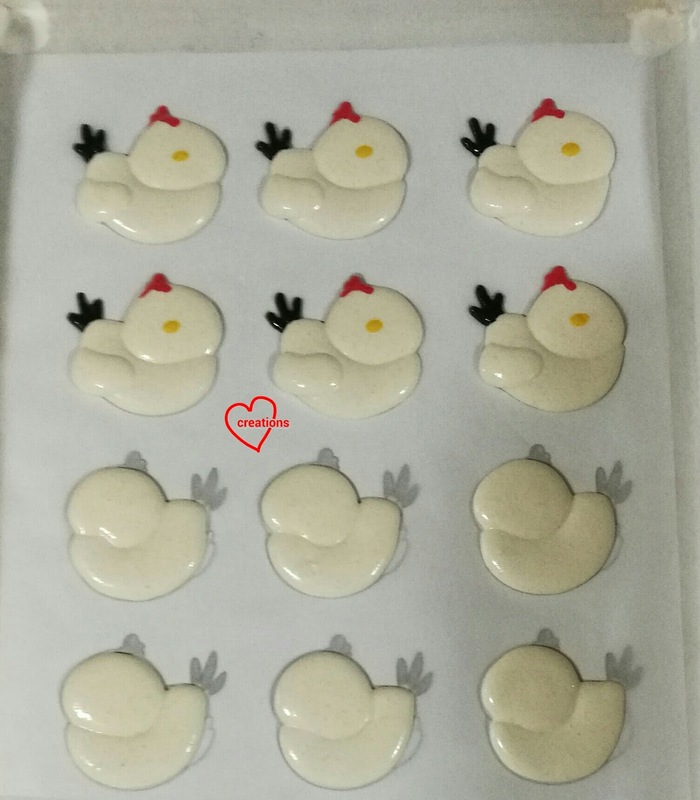 Piping chickens! If they look familiar, that's because I made them before over here but I used the French method previously. 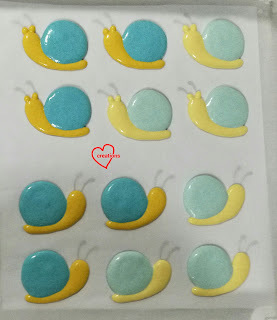 I decorated the shells with royal icing and edible marker. Kid friendly filling that can withstand storage out of fridge for several hours was requested. 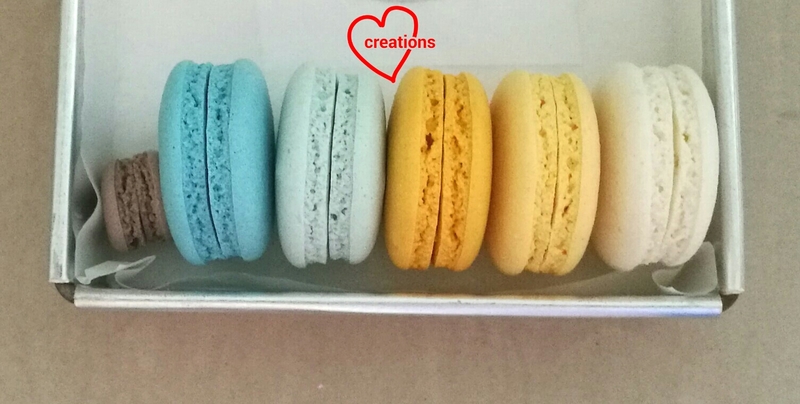 I filled the macarons with firm dark chocolate ganache and lemon curd or whipped strawberry white chocolate ganache. The strawberry ganache has higher fresh fruit puree content as I omitted heavy cream. It is also stable at Singapore's warm room temperature of 27-28℃. Here's the recipe for updated whipped strawberry white chocolate ganache recipe. *(Update 29/3/18): for a more intense strawberry flavour, you may make your own strawberry jam instead of using fresh fruit puree. Simply weigh out double the weight of fresh fruit puree required, place in saucepan together with a pinch of salt, a little sugar and half to one tsp of lemon juice. I don't use precise measurements as it's not necessary and it depends on your taste. Cook over low heat in a small saucepan until liquid is reduced and consistency is jam-like. Be careful not to burn the jam. Filling up all the shells! I hope they brought a smile to your face :). 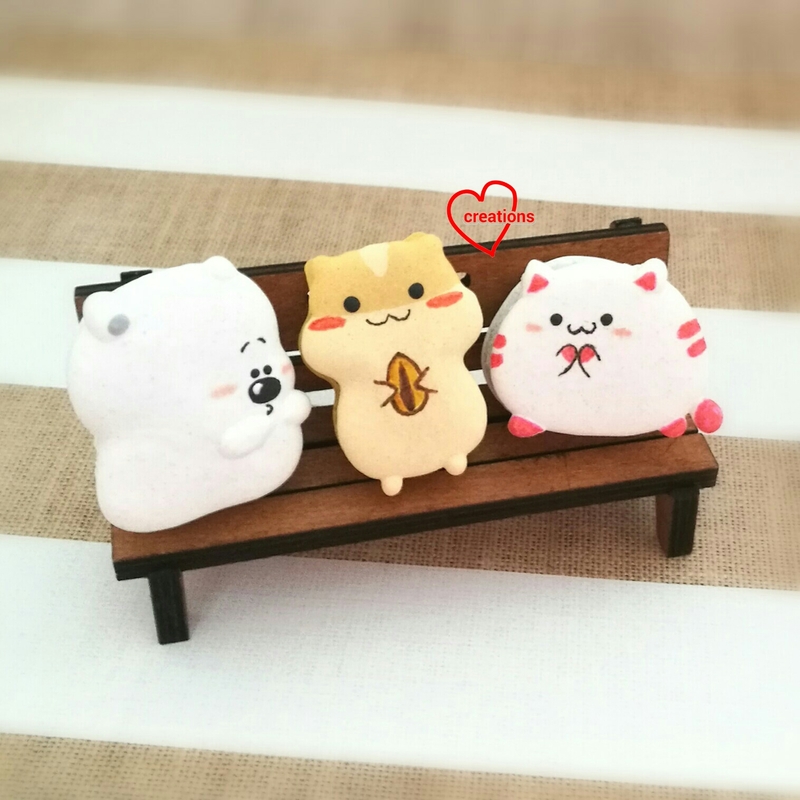 Bear, hamster and cat who are the best of friends! I have included some tips on making macarons that can survive transport and room temperature storage for extended periods at the end of this post. Checkout the awesome feet and cute face! 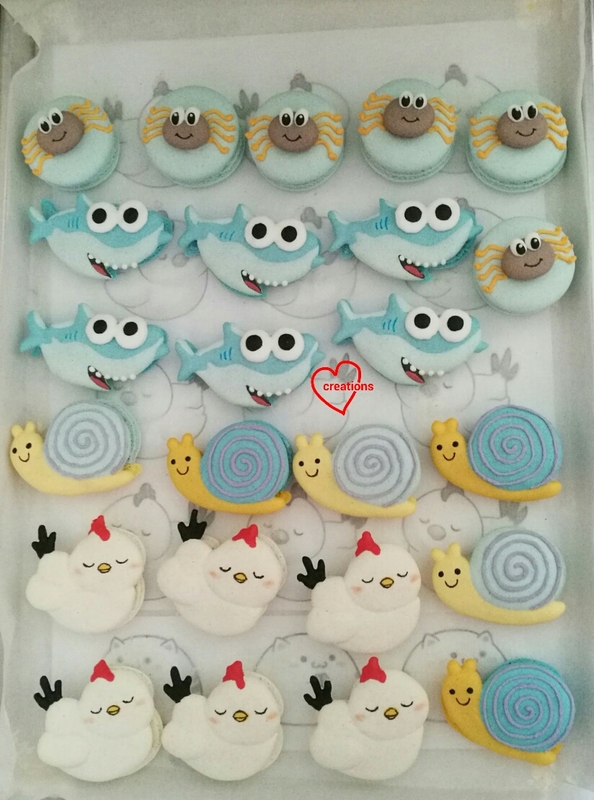 I brought these cuties along on a trip and the macarons survived after being roughed about on bumpy bus and speedboat ride. They tasted fine too even after staying out of the fridge for 2 days. 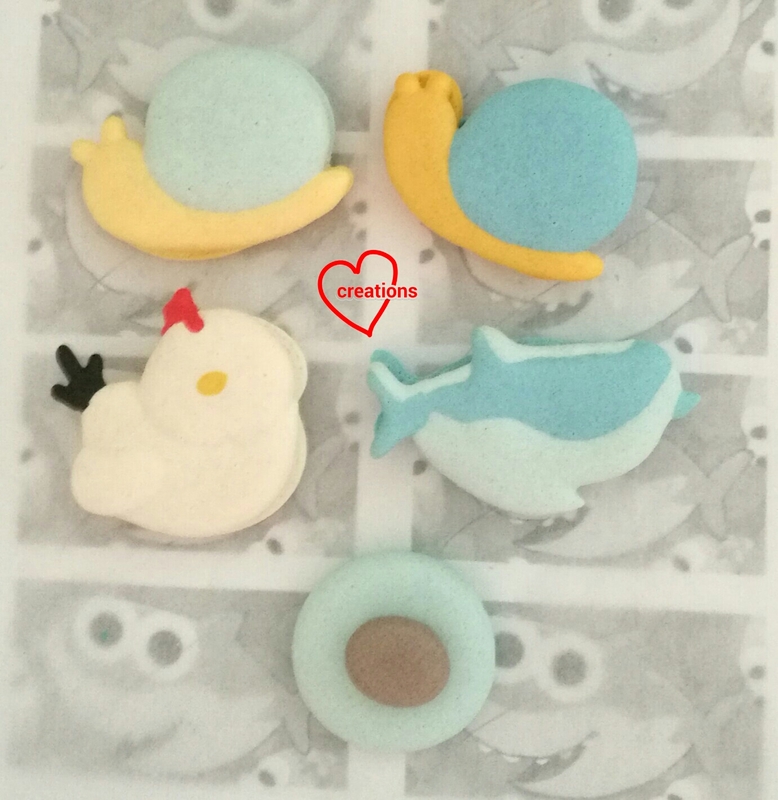 Some tips to consider when you want to make macarons that can survive like mine did. 1 . Try to go for designs that are generally rounder in shape without long thin parts sticking out of the shell so that they are less fragile. 2. 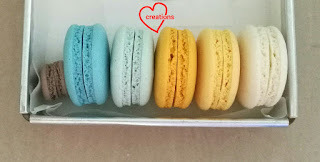 Place each macaron in paper cupcake cases to add some cushioning. 3. 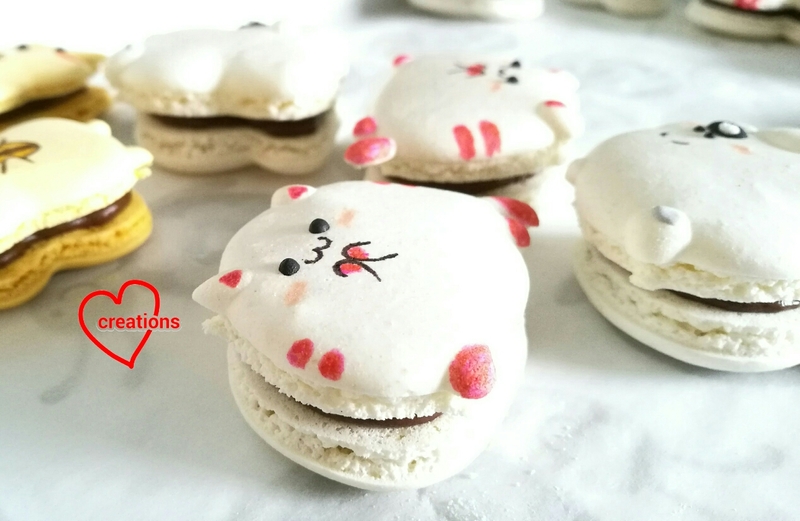 Consider ganache based fillings if you would like to transport the macarons overseas where refrigeration along the way may not be possible. 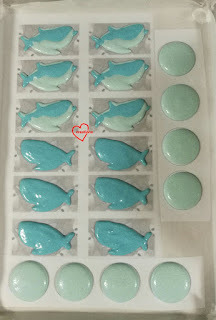 They can be kept out of the fridge at warm room temperature (27℃) for three days without going bad. 4. Make the ganache firmer than you usually would by increasing the proportion of chocolate to cream. You may refer to this recipe for the dark chocolate ganache I used but add 30-40g more dark chocolate to the recipe. 5. If you have runny centers for fillings like lemon curd, jam or salted caramel, try not to add too much as it will make the shells soggy fast. Try to encase most of the runny filling with ganache such that not much runny filling comes into direct contact with the shells. Recipe for lemon curd can be found here but replace lime with lemon. 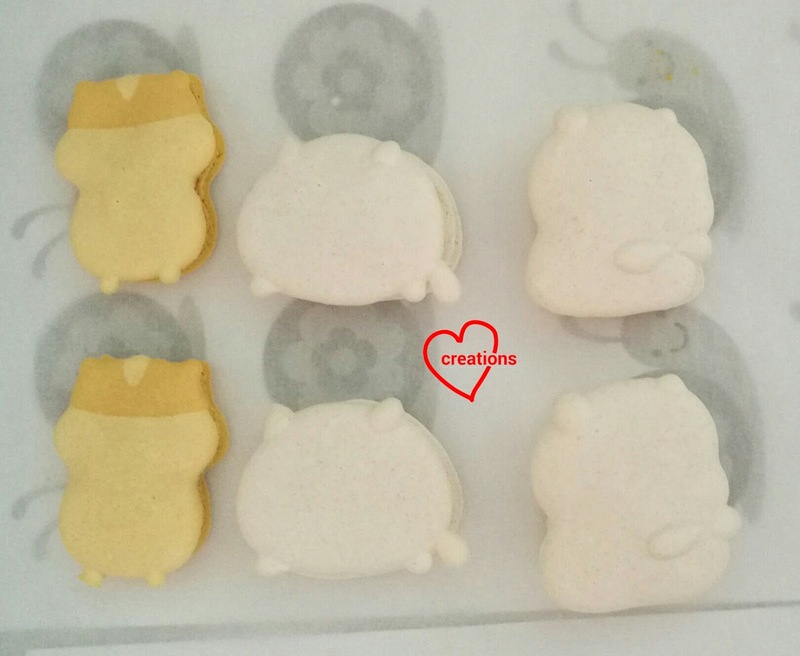 I love black sesame flavour but the colour isn’t the sweetest colour, so when I got this Pusheen request which is grey in colour, I was happy to try it again. I actually made Black sesame chiffon way back when I started baking. 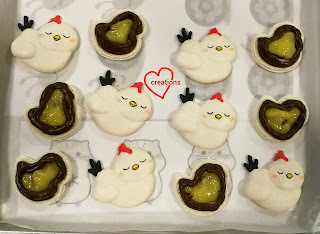 The original recipe I tried from Okashi few years back uses soy milk and brown sugar for the egg yolk batter, so feel free to substitute with these. Mine is a lighter version in terms of texture (as I use more meringue) with the same flavour intensity (if I remember the taste correctly). 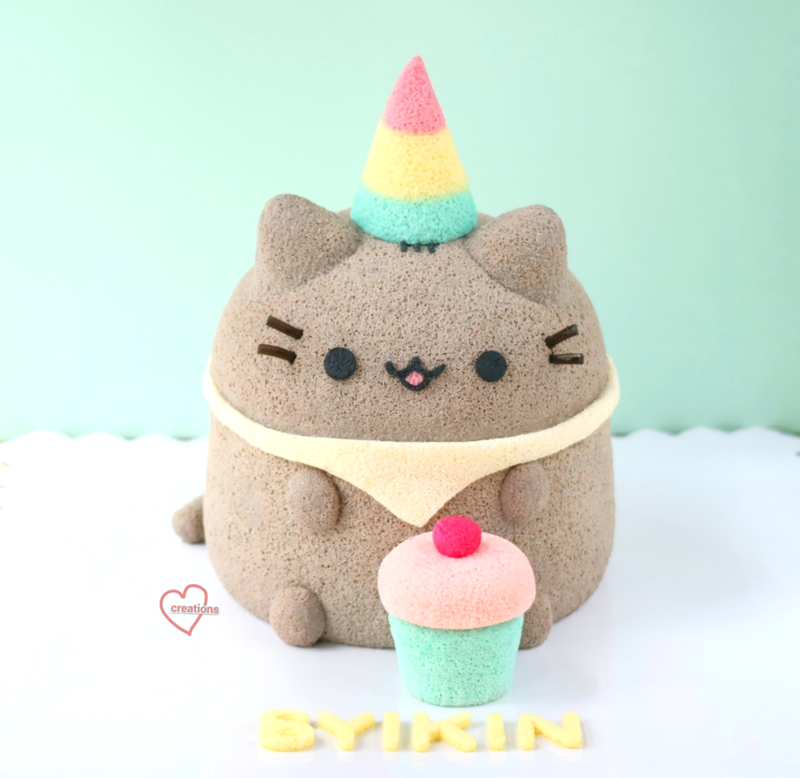 Briefly I made the Pusheen by joining a 6-inch tube pan with a ball cake pan chiffon cake at the top. The same black sesame chiffon recipe is used for the 6-inch pan and ball pan, which I have shared below. 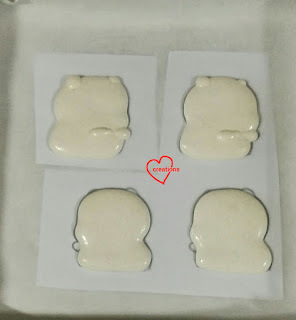 The hands, feet and ears are from cake pops molds. 3. Whisk in oil, black sesame paste, milk and vanilla extract in that order until well combined. 4. Whisk in sifted cake flour and mix till well-combined. In a grease-free, dry metal bowl, using electric mixer, whisk egg whites with cream of tartar till foamy. Gradually add in the castor sugar and whisk at high speed till firm peaks form, or just the point of stiff peak. 6. Gently fold meringue into egg yolk batter with a flexible spatula 1/3 at a time, till no streaks remain. 7. Pour the batter into a 6-inch tube pan. 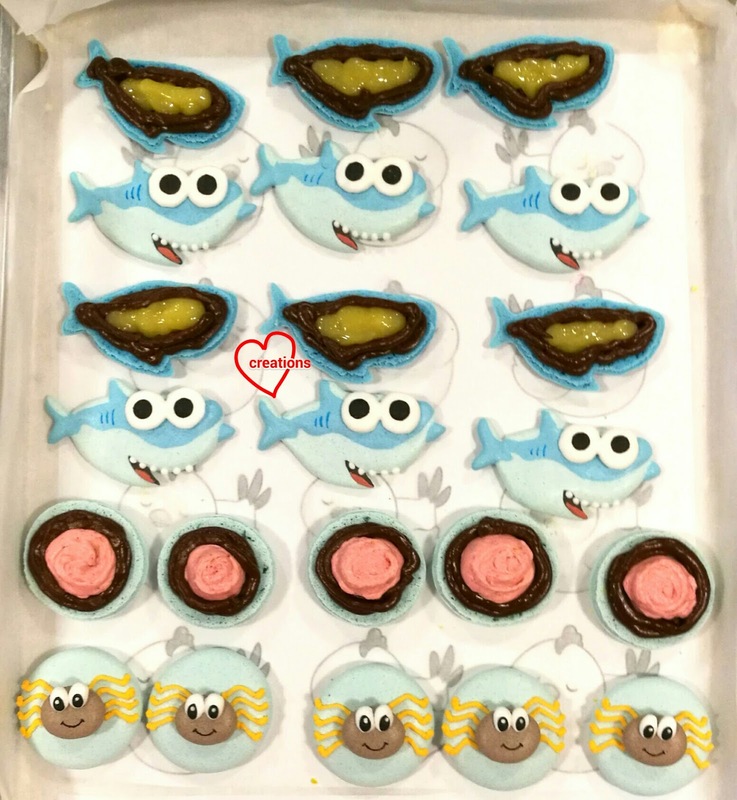 *Same recipe is used for the ball cake pan with some excess for cake pop molds. 6-inch tube pan: Bake at 160°C for 15 min, 140°C for 25+ min, or until skewer inserted into centre of cake comes out clean. Ball pan: 160°C for 15 min, 140°C for 20+ min, or until skewer inserted into centre of cake comes out clean. 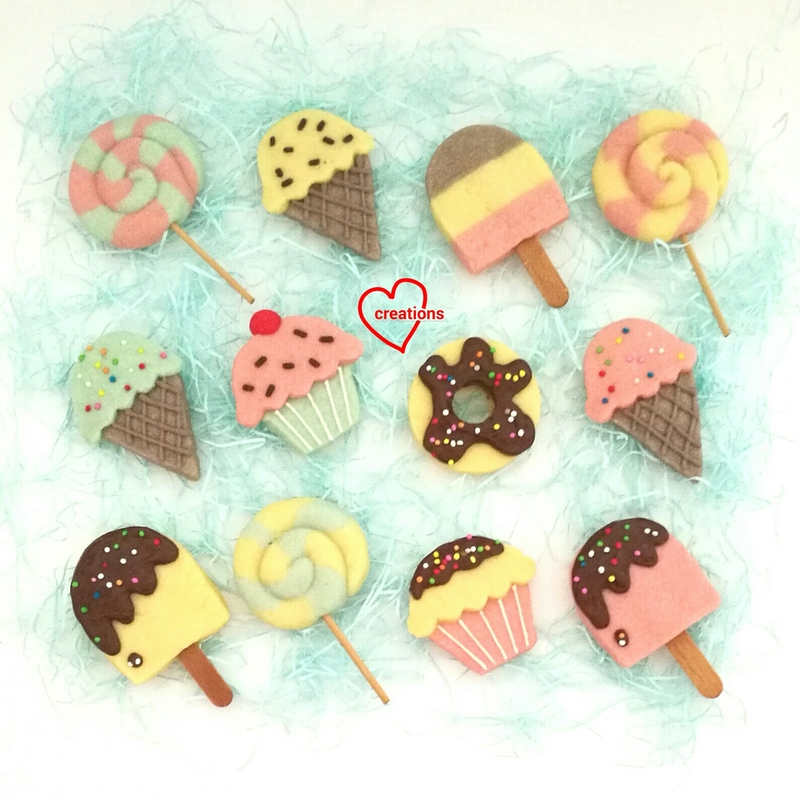 Cake pops (3-cm for limbs and 5-cm for ears): 160°C for 12-15 min. **If you use steam baking, you may need to bake for a few more minutes. You may need to adjust the baking time, depending on your oven. 9. Invert tube pan to cool on a wire rack completely. No need to invert for ball pans and cake pop molds. 10. 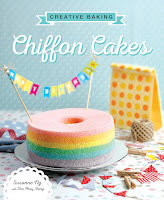 Unmould the chiffon cake by hand (see video tutorial ‘Hand unmoulding Chiffon cakes for a clean finishing’). The whiskers are from licorice string candy. I cut the facial features from charcoal sheet cakes but you can also pipe on with melted chocolate. The scarf is cut out from plain chiffon sheet cake. 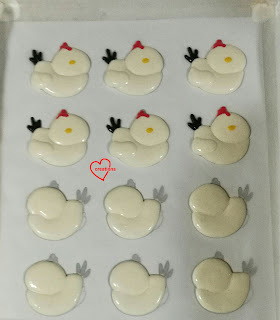 I pinched the 5-cm cake pops at the tips for the ears. 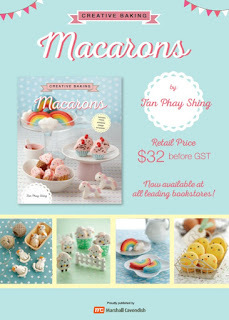 The hat is also made from rainbow chiffon cone pops (in Creative baking: Chiffon Cakes) - picture below from the book. 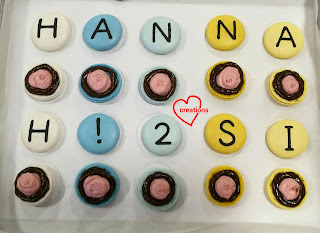 The 'cupcake' is also made from chiffon cake by baking chiffon cake in a cupcake liner and a 5-cm cake pop mold. I assembled the parts using melted marshmallows or chocolate as 'glue'. 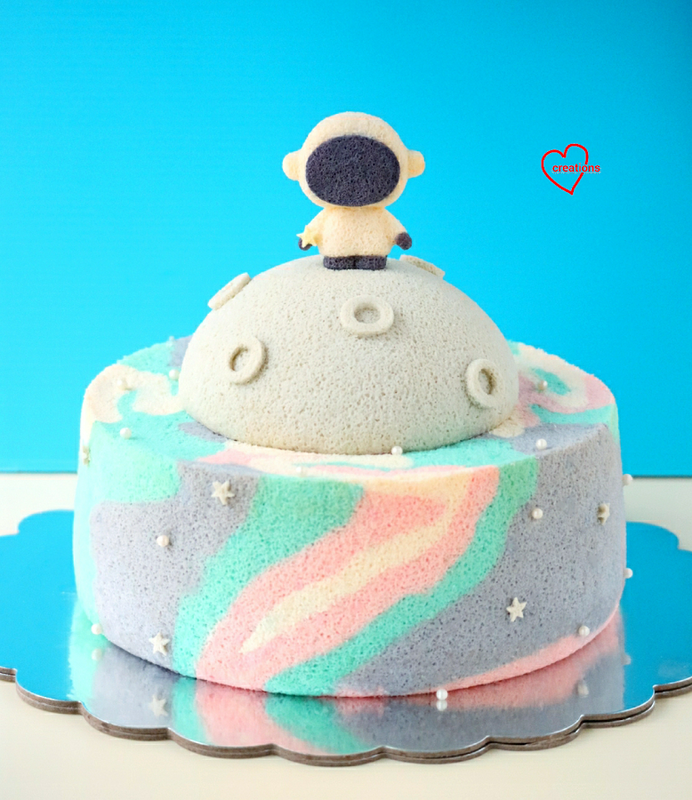 Lots of work went behind this cake so it's a bit hard to describe everything =p. 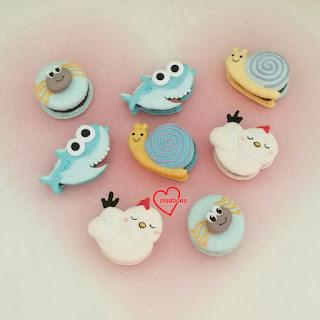 Hope you like this cute creation and yummy black sesame flavour! Thankful cake was very well-received too!